News organizations have been confronting the problem of a shrinking audience for more than a decade, but trends strongly suggest that these difficulties may only worsen over time. Today’s younger and middle-aged audience seems unlikely to ever match the avid news interest of the generations they will replace, even as they enthusiastically transition to the Internet as their principal source of news. 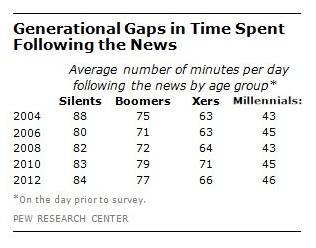 Pew Research longitudinal surveys find that Gen Xers (33-47 years old) and Millennials (18-31 years old), who spent less time than older people following the news at the outset of their adulthood, have so far shown little indication that that they will become heavier news consumers as they age. Notably, a 2012 Pew Research national poll found members of the Silent generation (67-84 years old) spending 84 minutes watching, reading or listening to the news the day before the survey interview. Boomers (48-66 years old), did not lag far behind (77 minutes), but Xers and Millennials spent much less time: 66 minutes and 46 minutes, respectively. Read the full article on the Poynter website.